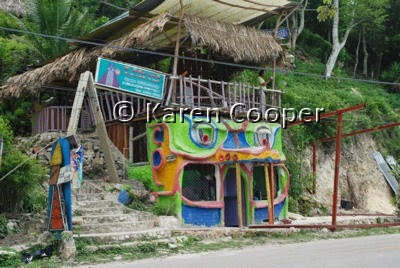 There is a small town called el Remate on the road to Tikal, Guatemala. The highlight of visiting this town was meeting local Guatemalan artist Erwin Bendfeldt, a truly unique and passionate sculptor. Erwin owns and operates the Sak Luk Hotel. In my opinion, the Sak Luk is Erwin's' unbounded imagination living in real life on his property. Every place you look you will find another unique piece of his artwork, some tucked between tropical plants that he collects for their healing properties. Besides an adventure for the senses to visit, the Sak Luk offers some excellent Italian food. Erwin is half Italian so his pasta dishes are mouth slurping good. I had a chance to talk to Erwin in depth about his artwork, and got a better sense of the sheer passion and love he has for his country and the natural elements he uses to create his work. He also tells of times when Lake Peten Itza was home to the fresh water crocodiles that inhabit some of the other lakes in this region. He tells of visions of seeing his spirit crocodile when swimming in the lake on full moon nights. Stories that are easy to believe when the jungle rules this area and the animals are part of the intricate intertwining of life here. Erwins newest undertaking is a snack bar (pictured above, not completed at time of photo) that resembles his totem, the crocodile. Sadly, I missed the opening of this newest piece of his artwork. But I am sure the spirit of the crocodile was there watching over with ancient eyes. There are many things in this world that defy explanation. I am learning to accept the unknown and unexplainable. And besides, it makes life more of an adventure than it already is. Wow, what an adventure you are having! It all looks so beautiful and the sights, smells and sounds must be re-awakening your senses in wonderful new ways. Thanks for sharing your journey! Thanks to your post, I am getting some insight into a country I knew next to nothing about. Great pics as usual too. I stayed at the Hotel Sak Luk in September also. There were only about five of us there, and it was so relaxing. I also enjoyed the yummy pasta dishes. Home cooking! Funny, I heard the story about the spirit crocodile too.